We recommend wearing loose-fitting clothing; wearing layers is a good idea, you can always remove some as you get more comfortable. 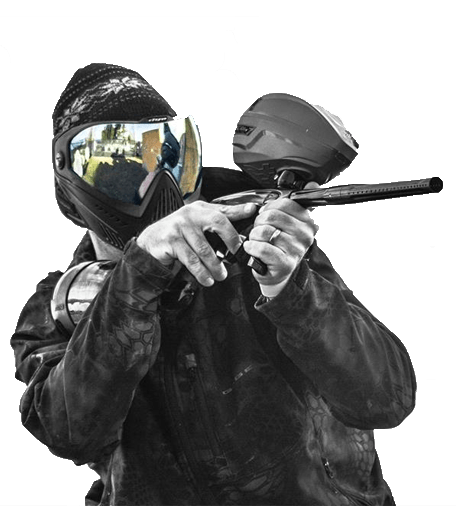 Receiving a paintball hit to bare skin can cause pain and shell fragments can nick the skin. Two places that are typically overlooked are the hands and neck; we recommend a hooded sweatshirt or turtleneck. Inexpensive cotton gloves are for sale on site for $3.00. If you want to bring your own gloves make sure they are thin, we do not suggest wearing thick snowboarding gloves as they do not allow your finger to fit in the trigger guard! The clothing recommendations for Low Impact & Standard Impact are same. We recommending layering up, as layers can be removed between games if you find you wore too many. bringing a change of clothes for the way home! It is easier to wash your clothes (yes, it does wash out) than it is to clean out your car! Any high traction shoe will work! Hooded sweatshirts are the best as the hood can be used to cover up the head and offers additional protection for the neck. More coverage is better! Turtle necks work too! Loose fitting is the key. Jeans work, but wear the biggest pair you have! Some people will wear snowboarding pants for the padding, but they can get warm on hot days. Sweats typically work well with basketball shorts under them for extra padding. Baggie is better. If you are playing outdoors something that is water repellent is normally better also! A backwards baseball cap or beanie works great! The hood from a hooded sweatshirt also works wonders! Anything to cover the head will work so long as it fits under the mask! Full foot coverage is recommended! Cover up where you can! Wear Long Sleeves & Long Pants. METAL CLEATS ARE NOT ALLOWED AT THE INDOOR ARENA. Metal Cleats are not allowed at the Indoor Arena. They can damage the turf and the bunkers. If you are found to be wearing metal cleats we will ask you to change your shoes. Repeat offenders will be asked to leave.